For several years our research group has focused on understanding the molecular mechanisms underlying epigenetic and genetic alteration in human cells leading to cancer formation and progression. Our specific research has concentrated on the mechanisms regulated by pRb-family proteins and governing the neoplastic processes. Our interest is to carry out the complex network of signals by which this family of proteins regulates cellular proliferation, survival and differentiation, and to disclose the mechanisms responsible for the regulatory disruption of these functions in the neoplastic process. In this context, we have suggested that the silencing of estrogen receptor alpha (ER-α) gene during breast cancer progression, as well as of p73 gene in osteosarcoma, could arise from epigenetic events mediated by pRb2/130 (and perhaps by pRb1/105 and p107) in association with specific enzymes involved in the chromatin remodeling. Furthermore, our work has shown that epigenetic mechanisms controlled by pRb2/p130, as well as epigenetic events affecting Rb2/130 gene expression itself, play an important role in retinoblastoma and lung cancer formation and progression, and can represent key events in the differentiation of cornea and conjunctiva normal cells. pRb family proteins (in particular pRb2/p130) and regulation of estrogen receptors (alpha and beta) gene expression by chromatin remodeling in breast cancer. Development of new protocols for cancer treatment by induction of estrogen receptors expression (estrogen receptor alpha and beta) through the design of new anticancer molecules. Development of new protocols for the identification of subgroups of patients at a higher risk of relapse and death who would benefit from particular therapeutic choices, more aggressive treatment forms, and more specific follow-up modulations. Role of pRb family proteins in lung cancer formation and progression. Specifically we are looking at: Genetic and epigenetic (Rb family gene methylation ) alterations in lung cancer. Development of new strategies for lung cancer treatment through gene therapy approaches and design of new anticancer molecules. Marcella Macaluso is a Research Associate Professor of Biology and Director of the Epigenetic and Genetic Program at S.H.R.O. Dr Macaluso’s research focuses on understanding the molecular mechanisms underlying epigenetic and genetic alterations in human cells leading to cancer formation and progression. Dr. Macaluso has extensive experience in the following areas: epigenetics and genetics, gene expression and regulation, cancer biology, cancer biomarkers, molecular biology, computational biology, cellular signaling, virology, proteomics, drug discovery and validation. Dr. Macaluso’s research has been supported by the Department of Defense, National Institute of Health, several private international foundations and organizations, including SHRO. She is the author of over 50 peer-reviewed publications and book chapters, serves as a member of editorial boards of professional journals, and is a frequent grant reviewer for federal and international funding agencies. 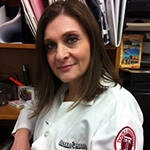 Dr. Macaluso has mentored national and international graduate students and post-doctoral fellows. Previous teaching assignments of Dr. Macaluso included courses in Molecular Clinical Oncology, Epigenetics, Genetics and Pharmacovigilance.